Mastery North’s Harold Daily splits Constitution’s Tyree Mitchell (left) and Abdul Riggins (right) during the Pumas’ win on Wednesday. In previous seasons, Harold Dailey watched intently as other players led Mastery North during tense times late in games. This year, however, most of the Pumas looked to Dailey in crunch time. 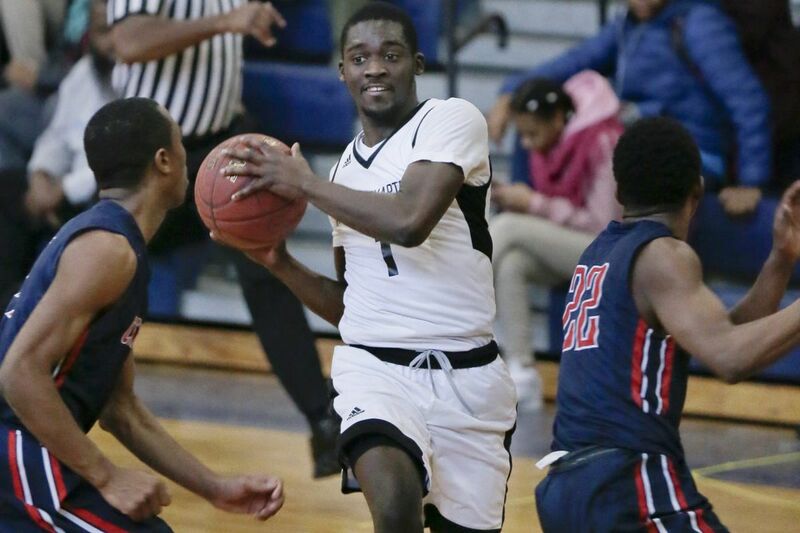 Wednesday afternoon, the host Pumas needed all the poise they could muster to hold off perennial power Constitution, 76-69, in Public League Division A action. "Before, I would usually just listen and play my role," said Dailey, one of only two seniors on the team. "Today, it was different. I had to tell people where to go … ." And the Pumas (8-0, 1-0) — newcomers to Division A — followed. Dailey scored a team-high 26 points, added 8 rebounds (six offensive), and provided a calming presence when Constitution rallied from a 12-point deficit in the third quarter and tied the game at 63 with just less than 4 minutes remaining. "To be honest, I just want to do everything so that my team can win," the 5-11 guard said. "If that was rebounds, diving on the floor, taking charges, any of that. Today, it was points and rebounds, so that's what I did for my team today." His role in previous seasons was to focus on stingy defense and then get the ball into the scorers' hands. Mastery North senior Harold Daily. But against the Generals' frenzied, late-game pressure, Dailey often got the ball and made plays for himself or others. "He slips through the cracks sometimes, because other teams don't know who he is yet," Mastery coach Terrence "Nip" Cook said. "But he's been great as a leader for us." The Pumas other senior, Rodney Phillips, battled through a fever until he lost his lunch on the court just before the third quarter. Spirited contributions off the bench from Amin Dandridge (6 rebounds) and Tahj Campbell (3 blocks) helped fill the void. Lakeem McAilely scored 21 points, grabbed 12 rebounds, and blocked four shots. Jamir Reed finished with 13 points and 8 rebounds. Constitution was led by Damond Wall's 28 points on 11-of-17 shooting. The Generals, however, finished 13 of 29 at the foul line, including misses on their first eight attempts and just 1 of 6 in the final two minutes. While Constitution has won Public League, District, and PIAA championships, Mastery North may have established itself as an up-and-coming force in the Public League. "We don't feel like it's an upset at all," Dailey said. "We felt we could do this from the start. We feel as though we can beat anyone in Division A, to be honest." He added: "We can actually play way better than this, to be honest. This is just the start. I feel pretty good about this team." MN: Harold Dailey 26, Lakeem McAilely 21, Jamir Reed 13, Alvin Williams Jr. 9, Tahj Campbell 4, Amin Dandridge 2, Rodney Phillips 1. C: Damond Wall 28, Tyree Mitchell 12, Keeshaun Hammonds 10, Leeron Wills-Worthy 8, Jihad Saunders 4, Abdul Riggins 4, Jahlil Davis 2, Hakim Hudson 1.